WE’RE IN THE MONEY is an eclectic collection of stories with the central theme of money—$$$ earned, stolen, laundered, buried, owed, occasionally counterfeited and often the cause of evil. WE’RE IN THE MONEY is an eclectic collection of stories with the central theme of money—$$$ earned, stolen, laundered, buried, owed, occasionally counterfeited and often the cause of evil. Some stories transport you to exotic or fanciful places; some go no farther than the neighborhood bank. 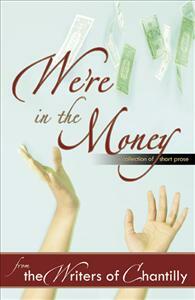 Each author interprets the word money in his or her own way. So, welcome, Reader! You have won the lottery. I’ll bet my bottom dollar you’re going to enjoy our stories. They’re all good as gold.